Let’s face it. Sometimes, we just need to tell that special someone how awesome they are. A card is a great way to do it! Whether it’s on-time or belated, a real, paper birthday card is a wonderful way to wish friends and family a happy birthday! Congratulate your hardworking co-worker on their new promotion. It takes a special person to watch your beloved Wilber. Thank your dog-sitter for taking such good care of your pooch with a sweet thank you card. Bunnies! Chicks! Easter eggs! We’ve got them all with our wide selection of Easter cards. Dad, you’ve been there through it all. (And you still love me!) Each June, send Dad a card for Father’s Day. Grandma always loves to hear from you, and a card is a wonderful way to send your love through the mail. Exploring the world is great, but there’s no place like home! Send your homesick loved one a reminder of their favorite place on earth. Everyone likes to be reminded that they’re loved. Like Lionel Ritchie crooned, “I just sent a card, to say, I love you!” Isn’t that how it goes? 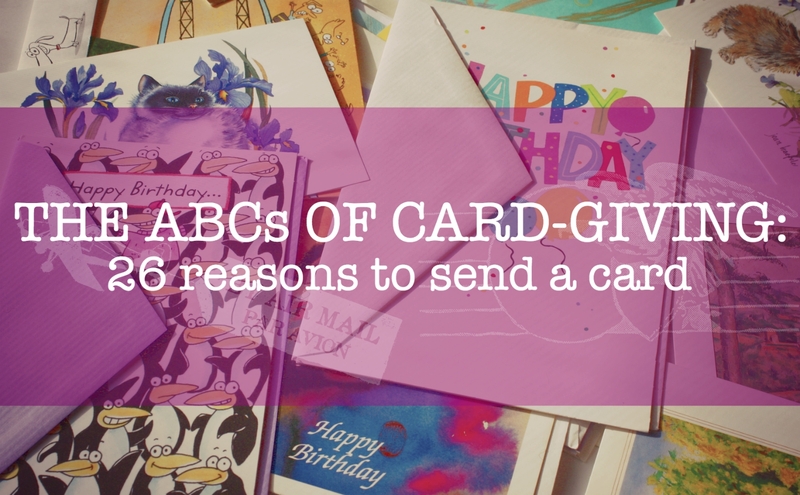 Which day is best for sending someone a card? Any day! Make your friend, family member, or special someone feel the love with a card just ‘cause. First day at a new school, a major milestone, or a job well done: no matter the occasion, kiddos love to feel like they’re doing a great job. School’s out for summer! Let the fun begin and congratulate your kiddo on another school year under her belt. Now, which way to the pool? Mom’s been there from the beginning — quite literally. Remind Mom that there’s no one else on earth more special! Oh, baby! When friends or family welcome a bundle of joy into this world, a card is a wonderful way to send warm wishes and heartfelt congratulations! Oops. My bad. Really sorry. Sincerest apologies. However you want to say it, saying you’re sorry with a card can mean a lot. Four score and seven years ago, our forefathers thought it was a really great idea to send a President’s Day card! How do you spell FREEDOM? I-Q-U-I-T! Celebrate your friend’s next career adventure with a celebratory card! When the going gets rough, the rough need a card. Send your wishes for happier days and better times ahead with a heartfelt card. Sisters can be some of the best friends you’ll have, ever. Let your sister know how much she means to you with a sweet (or sassy!) card. Danke. Grazie. Merci. However you want to say it, saying thank you can take your expression of gratitude to the next level. Unexpected mail - people love it! You know the feeling: opening the mailbox to see a real card with a real stamp. Send that feeling of joy to someone you know today! Honeybun, I love you to the moon and back, especially if it’s February 14. Show your sweetie you care (and you remembered!) with a Valentine’s Day card. A wedding is one day, but wedding vows last a lifetime. Send your husband or wife a card to celebrate the day you pledged your love for each other. Hey, if Santa can visit every house in the world, it shouldn’t be any trouble for you to send a few cards to your best friends and family. Teachers have one of the hardest jobs in the world. Give your teacher a pat on the back with a meaningful card! October is National Breast Cancer Awareness Month. Celebrate your family member or friend’s recovery with a card!